"The college admissions scandal exposed criminal and unethical actions that undermine the promise of the American university system. To get to the root of the crisis, this roundtable discussion—curated by Public Books and JSTOR Daily—asks scholars to go back to the drawing board and answer the most basic of questions: What would constitute a fair college admissions process? As sociologist Jonathan Mijs argues, opportunities for demonstrating merit are far from equally distributed. In the United States, where racial residential segregation and local control of schools combine to disproportionately relegate nonwhite (especially black) students to underfunded schools, the claim that anything approaching equal opportunity exists is laughable." Read more. “Research has demonstrated a dramatic rise of income inequality in the West. Today, across advanced capitalist countries, the top ten percent of households take home about a third of all income and own two-thirds of all wealth. Despite what scholars, journalists and some politicians consider a worrying trend, there is no evidence that people have grown more concerned about inequality. In fact, citizens of more unequal societies are less concerned than those in egalitarian societies. How to make sense of this paradox?" Read more. "The UK is no exception to rising inequality. Income inequality is on the rise across the western world, but most people don’t seem to care. My research, published this month in the Socio-Economic Review, is an analysis of 25 years of data on income inequality across 23 western countries including the US and Europe. It finds that, paradoxically, the higher inequality rises, the more people believe that economic success is based on merit. People look at success as the result of hard work and talent and downplay the role of family wealth and connections. Citizens in some of the most unequal countries, like the US, believe most strongly in meritocracy." Read more. "Jonathan Mijs, an assistant professorial research fellow at the London School of Economics and Political Science, recently published a paper documenting that in societies with high rates of income inequality, people are more likely to believe success is a result of individual hard work and effort than those living in societies with a more equal distribution of financial resources. That may sound counterintuitive. But as inequality increases, people are less likely to meet and mix with people outside their cohort. “Money becomes more than a figure on a person’s bank account; it defines where people live, work, who their friends are and with whom they form a family,” Mijs tells me. “From their increasingly insular social circles, the world looks more equal and more meritocratic than it really is. When your friends, neighbors and colleagues share the same set of privileges or disadvantages, you no longer notice the structural forces holding you back or pushing you ahead." Read more. "Inequality is on the rise in Britain, as it is across most of the West. Since the 1980s, income gains have been concentrated among the top 1 per cent, whose economic fortunes have grown at a much faster pace than the rest of society. The top 10 per cent of households now take home about a third of all income, and own two-thirds of all wealth. This widening gap between the haves and have-nots increasingly preoccupies scholars and journalists, and policymakers, all the way to the World Economic Forum in Davos. Curiously, however, the evidence suggests that few citizens share these concerns. In fact, people in some of the most unequal societies seem to be the least worried about inequality. Why is this the case?" Read more. "Those on the progressive left have been perplexed that rising social injustice hasn’t led to much sign of the oppressed rising up, either at the ballot box or through more physical acts of protest. New research out on Wednesday suggests some explanations – though these will be of precious little comfort. 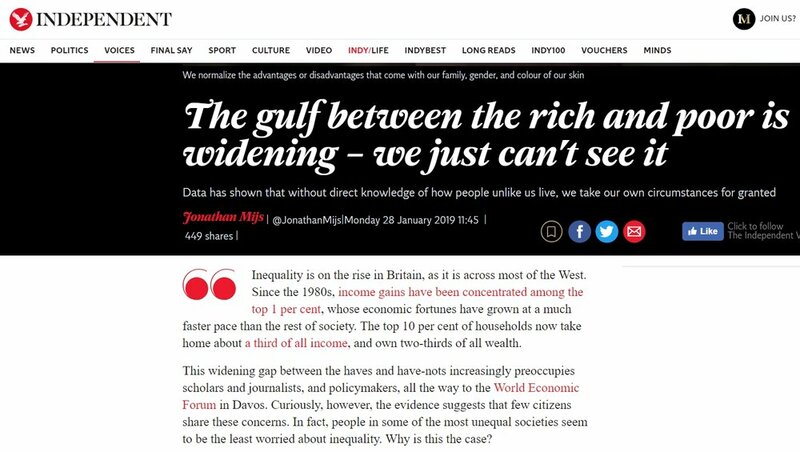 Looking at surveys across 23 western countries since the 1980s, Dr Jonathan Mijs of the London School of Economics International Inequalities Institute monitors how, as countries become less equal, attitudes of the majority shift in the wrong direction." Read more. "We are witnessing a surge in news reporting and scholarly interest in inequality. Most people now know some stylized facts about the unequal distribution of income and wealth. Throughout the West, the top 10 percent takes home a third of all income and owns two-thirds of all wealth. The United Kingdom is no exception. So, how has the other 90 percent responded? We've seen protests here and there. The Occupy movement caused quite a stir, but already feels like a distant memory. What's striking is the absence of large-scale public unrest, mass demonstrations, revolt. For most people, inequality is business as usual." Read more. "Inequality in America is on the rise. Income gains since the 1980s have been concentrated at the top. The top 10 percent today take home 30 percent of all income, and control over three-quarters of all wealth. We have returned to the level of income inequality that marked the Great Depression of the 1920s and 1930s. Who gets what in America continues to be impacted by a person’s race, gender and family resources. What’s striking, however, is how little people seem to notice." Read more. "About 640,000 incarcerated people are released back into communities each year, and between 1995 and 2010 there was a 240% increase in the number of non-profit organizations providing prison re-entry services. The study of prison re-entry often focuses on how prisons prepare people for life “on the outside” or on the specific elements that influence the likelihood of recidivism. Jonathan Mijs, in a recent Sociological Forum article, studies this institutionalizing of the reentry process and how non-profits function as a link between the penal and welfare state." Read more. "World rankings like the Programme for International Student Assessment (PISA) have emerged as the litmus test on how schools are and are not helping students succeed. Politicians, educators, and specialists dwell on American students' laggard position or Singapore's success. But what do students think of their own performance? And what can we learn about learning environments and long-term achievement from students' self-perceptions of success or failure? In recent research, Jonathan Mijs (this blog post's co-author) details how students from various countries understood their own academic performance, particularly in instances where they did not score well on tests or coursework. Comparing 128,000 students across 24 nations in Asia, Europe, and North America revealed that students' responses were only loosely connected to the country in which a student lives, their school's resources, or that student's social background. Rather, these students' attributions of failure show a close correlation to the way a student's school is organized." Read more. "Politicians and pundits in America wonder where the rip-roaring popularity of protest candidates Donald Trump and Bernie Sanders originated. The answer may lie in Europe. Trump and Sanders, in defying conventional political expectations, follow a long list of European populist leaders. Over the last two decades, the continent has seen the rise of Marine le Pen in France; Geert Wilders in Holland; Silvio Berlusconi and his successors in Italy; the People’s Party in Switzerland; the Freedom Party in Austria; the Progress Party in Norway; the Alternative for Germany. The list goes on. Regarding the rise of Trump and Sanders as extraordinary events risks mystifying them. It also fails to acknowledge the powerful forces these politicians thrive on. Looking more closely at the rise of populism in Europe over the past two decades gives us a better understanding of today’s American politics and the forces driving protest politics’ success." Read more.